My housemate said nothing as I dragged my latest find into our house. After a moment the tension got too much. ‘Yes I can’ my flatmate remarked, gesturing at the bassinet handle that had broken off in my hand. I said nothing but knew my silent stance would betray me. I stepped aside to reveal a large portrait of the Swiss Alps. ‘Oh good god.’ My housemate mumbled. Buy small plastic babies, fill bassinet with small plastic babies and then leave on porch. 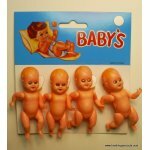 Maybe scatter some other plastic babies around it for effect with a trail of plastic babies leading out onto the street. Watch from my office to see if anyone really cares about abandoned little plastic babies. Have a baby and then make the bassinet not only a great find but also functional. Don’t do anything with bassinet. Just leave the bassinet alone or better yet, throw it out. STUPID IDEA. As night came around I informed my housemate that I would be turning my bassinet into a herb garden, after all I’m adult. He seemed satisfied with the idea. I then wished him a good evening and set about trying to find where I’d misplaced my invisible string.